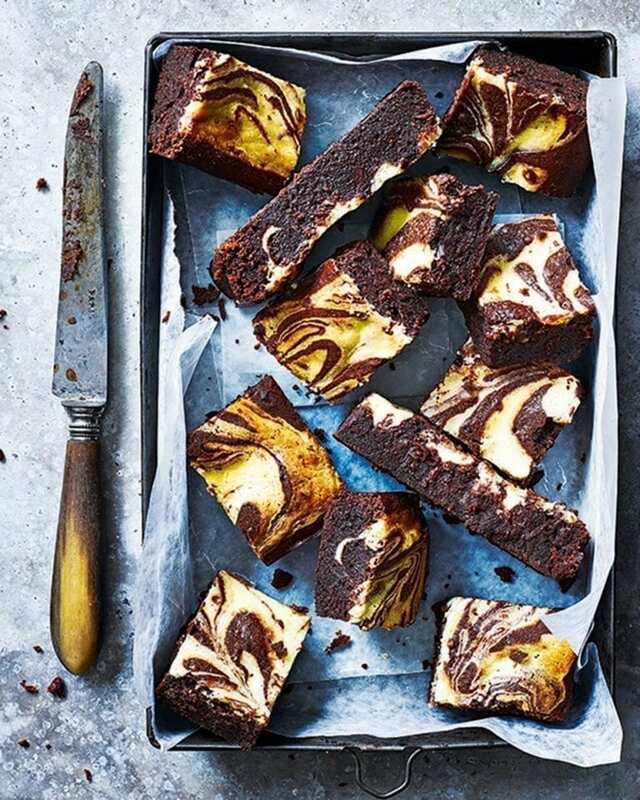 Eric Lanlard swirls a rich cheesecake-like filling though a decadent and fudgey chocolate brownie for an afternoon treat you won’t be able to resist. Heat the oven to 180°C/160°C fan/gas 4. Melt the butter and the chocolate in a large heatproof bowl set over a pan of barely simmering water, stirring occasionally (don’t let the bowl touch the water). Remove the bowl from the heat and cool slightly. Stir the sugar, vanilla and a pinch of salt into the chocolate mix, then beat in the eggs using a wooden spoon or electric hand mixer until smooth. Stir in the coffee, sift over the flour, then beat until just combined and glossy. For the marbling, beat the cream cheese in a mixing bowl until smooth, then mix in the sugar, egg and vanilla. Spoon the coffee chocolate mix into the tin, then pour over the marbling mix and use a knife to cut through both mixes for a marbled effect. Bake for 30 minutes, but keep an eye on the brownies as you may need to cover the tin with foil for the last 10 minutes of cooking if they start to brown too much. Cool in the tin, then cut into 16 squares. The espresso in the brownie mix doesn’t give a coffee taste but it brings out the chocolate flavour. The cream cheese brownies will keep for up to 48 hours in an airtight container. This recipe is by Eric Lanlard.